When foliage season approaches its peak and the autumn color reaches its climax, the terrain of Southern Vermont affords a spectacular landscape for engagement photography sessions. All of Vermont has the potential to be resplendent during autumn foliage seasons, but the elevation variations of Southern Vermont provide the possibility of stunning views of valleys, mountains, and color variations exclusive to New England. Having a pulchritudinous bride-to-be and a comely groom-to-be intertwined into the scenery creates framable, salable images such as the one seen here. 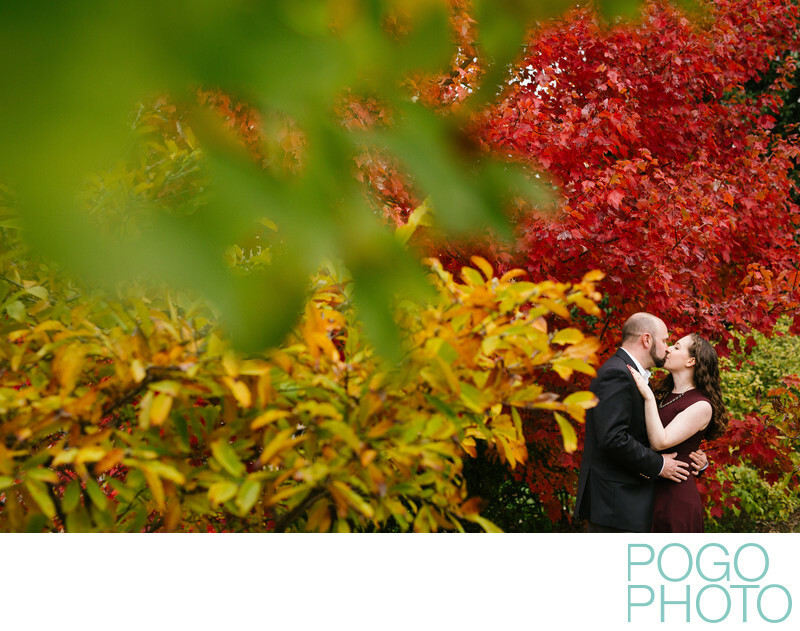 The demand for fall engagement sessions is matched by the hyper-truncated wedding season that attempts to prognosticate the exact weekend that will overlap the most vibrant of foliage. (Historically this weekend is often Columbus Day Weekend; even if it's not the exact peak, this is the perfect weekend to enjoy the crisp feel of Vermont's stunning fall weather.) We enjoy seeing the evolution of Vermont’s leaf peeping season and its devolution into stick season after nearly all of the leaves have dropped. The science behind the leaves’ color change is rather intriguing. For most trees, the change of color is primarily from the reduction of the color green. Chlorophyl, the pigment present in leaves that you have thought about exactly twice since advancing past the second grade, provides the green colors in all of their hues. When it is produced by the trees at a decreasing rate as the temperature drops, colors that have been present all year begin to display themselves, since the green element is no longer present to overwhelm them. Browns, yellows, and some oranges begin to peak out, but the timing and intensity is contingent on the elevation and the amount of sunlight reaching the leaves. A difference of just a few feet can change the color drastically, and adjust the timing of the colors’ arrival by days, if not weeks. New England’s foliage is world renowned because of the types of trees in the region, and what they do once the green color is gone. Nearly seventy percent of the trees in Vermont, including the infamous maple, go the extra mile and produce additional pigments in their leaves. Anthocyanins, while present in some trees growing in other portions of the country, take center stage here. Hiding in the sap when they are produced in the late summer, they leach their way into the leaves during fall, altering the energy gathering process of the leaves and subsequently producing brilliant colors. The more sunlight during the day and the cooler the nights, the more brilliant the reds, magentas, and purples will be. Centuries of data collection can assist in attempting to forecast a season for a particular area, but no one is quite sure of how great it will actually be until September and October when they can view it with their own eyes. 1/640; f/2.8; ISO 800; 50.0 mm.